A physician assistant examines a patient as her mother holds her hand, January 2018. Cuts to programs that provide children with health care, nutritious food, and stable housing will compromise their development during a critically important time. Reducing poverty and providing access to the basics such as food, housing, and medical care is of the utmost importance for young children. Research shows that poverty has deep and lasting negative effects on child development by introducing stressors that affect the foundations of brain architecture as they are being laid. Much like a house needs a solid, well-constructed foundation, children’s developing brains require a strong base.5 Programs such as Medicaid and CHIP, SNAP and the Special Supplemental Nutrition Program for Women, Infants, and Children (WIC), TANF, housing assistance, LIHEAP, tax credits, and Supplemental Security Income should be understood as smart, evidence-informed policies that give children a promising start in life. Unfortunately, instead of addressing the needs of low-income and middle-class families through policies such as paid leave, child care, and increasing the minimum wage, the Trump administration and House Speaker Paul Ryan (R-WI) are pushing for deep cuts to programs that help families afford the basics, all to pay for a $1.5 trillion tax cut that largely benefits wealthy individuals and corporations.6 In addition to cutting funding for these programs, President Donald Trump and Republicans in Congress are poised to increase barriers to accessing benefit programs through increasing administrative burdens and imposing work requirements. Even when children are not the direct targets, they will be significantly affected by these cuts and increased barriers to access. Children, parents, and other family members share resources, live under the same roof, and eat the same meals. Thus, threatening family economic security will inherently affect children. Benefit cuts and additional red tape will increase poverty and food insecurity while decreasing health insurance coverage rates for people of all ages. The Trump administration and its congressional allies give lip service to catchphrases such as workforce development, but their plan will actually undermine families with young children who are working to reach the middle class. Benefits programs have had profound effects on reducing child poverty and deep child poverty—children whose families have incomes below 50 percent of the federal poverty level. Using a poverty measure that considers public benefits and is based on a broad definition of necessary expenditures—such as food, clothing, shelter, and utilities—researchers estimate that in 2016, benefit programs cut child poverty from 25 percent to 16 percent.7 In other words, nearly 1 in 4 children would live in poverty if programs such as the Supplemental Nutrition Assistance Program, Medicaid, and refundable tax credits did not exist. The federal government could do more to reach a greater number of children and to ensure the efficacy of these programs. Children of color and children in immigrant or mixed status families face barriers to accessing programs, including English language proficiency, concerns about the safety of undocumented family members, and racial prejudices; therefore, they do not fully benefit from the protective effects of these programs. Benefit levels are often too low to purchase healthy food and afford stable housing. But further reducing access to these programs would roll back decades of progress in reducing child poverty, exposing more children and families to the toxic stress associated with living in poverty. Additionally, children need nutritious food to fuel their growing brains, a safe bed to sleep in at night, and a competent health professional to monitor their development. It goes without saying that children rely on their families to provide these necessities and that parents, children, and other family members share resources, including meals and homes. As such, children’s healthy development is inextricably linked to their families’ economic well-being. Because families in poverty may struggle to secure these needs, programs that provide these basics are critically important for children. Children’s development is linked to parents’ well-being in deeper ways as well. This is because children’s brains develop rapidly in early childhood through a process that is highly sensitive to their social and physical environment. Children’s brains form more than 1 million new neural connections per second in early childhood, which are reinforced by repeated use. Responsive, reliable interactions between adults and young children strengthen these connections.9 When parents are stressed about meeting their families’ basic needs, they may lack the emotional and physical energy to provide the attentive and sensitive caregiving that helps children thrive. Having unresponsive or inconsistent exchanges with adults activates young children’s stress response and floods their developing brains with harmful stress hormones.10 By improving families’ economic circumstances and emotional health, benefits programs provide children with a buffer to poverty’s negative effects. Young children make up a significant portion of benefit program participants. In the United States, 1 child in 5 lives in poverty.11 Many young families struggle because parents are typically beginning their careers—and thus earning relatively low wages—when children are young.12 Between diapers, food, child care, and other essentials, parents’ already limited resources are stretched thin. The critical programs discussed below provide children and families with the resources they need and help mitigate the effects of living in poverty. 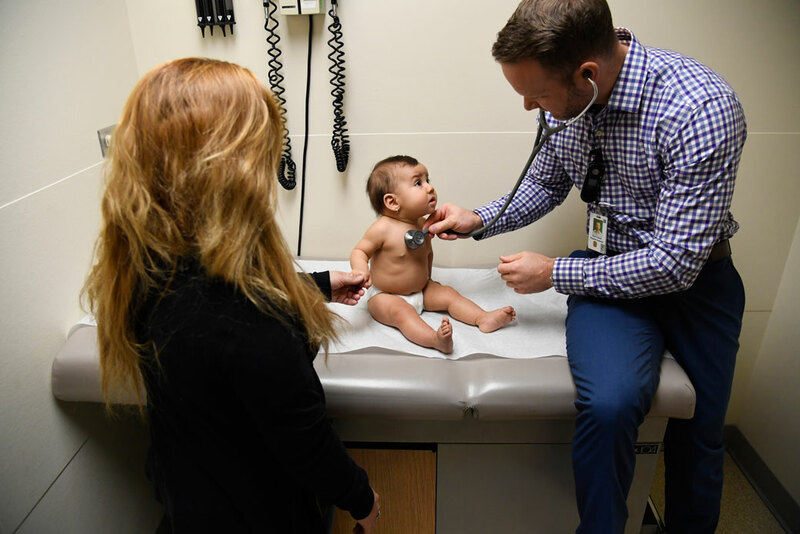 Without health insurance and benefits such as EPSDT, many children would not be able to see a doctor for well-child checkups and many parents would be unable to seek medical treatment when their child is sick or injured. EPSDT plays an important role in early diagnoses and treatment, and without it, many children could have disabilities or developmental delays that go undiagnosed, affecting their development over the long term. While housing assistance programs and LIHEAP have yet to be funded at levels that allow these programs to address the full need, fewer households—especially those with children—would have access to safe housing and utilities if programs were cut further. However, since becoming a block grant in 1996, funding for TANF has eroded significantly and has not kept pace with inflation.38 As a result, in 2015, only 16 percent of children living in poverty received assistance through TANF.39 Furthermore, even when families receive TANF cash assistance, the amount is too small to lift families out of poverty: In the median state in 2017, a family of three received about $430 per month.40 If TANF were cut, this benefit would likely shrink by an even greater degree. Social Security and SSI are critical for keeping families with young children out of poverty.50 Research shows that SSI cuts poverty nearly in half for children with disabilities and that access to the program helps improve longer-term economic and employment outcomes for children.51 Social Security helped lift more than 1 million children out of poverty in 2016.52 Without access to Social Security and SSI, the child poverty rate would substantially increase, especially among children with disabilities. Taking away benefits through so-called work requirements would hit families with young children hard. Although 83 percent of children younger than age 6 in low-income families have at least one parent in the labor force, many parents experience periods of unemployment or unstable work. Low-wage work is increasingly unpredictable and irregular. From week to week, circumstances outside of the employee’s control may result in fluctuating hours. Workers may spend many hours “on call”—be asked to stand by in case they are needed. Unlike in many professional positions, however, these workers are not paid a salary unless they are asked to work. And despite spending many hours either at work or on call, some of these parents may find that they fall short of new work requirements. When children are young, their intensive physical and emotional needs often create a barrier to stable, full-time employment for parents, especially because many low-wage workers lack access to paid leave.55 Parents may need to miss work to care for a sick child or cut back on their hours, and, as a result, they may not meet their state’s requirements even if they are working. Some may leave the workforce altogether to be a full-time caregiver. Introducing red tape to benefit programs will reduce children’s access to critical services when they most need them, even if children themselves are not the target. For example, Medicaid work requirements for parents could increase the likelihood of parents and children being uninsured, as the two are closely linked. In fact, 99 percent of children whose parents are insured have coverage, compared with just 80 percent of children whose parents are uninsured.56 What’s more, adults losing health insurance can decrease family economic security and compromise adult health, which by extension hurts children. These policies can lead to long-term negative outcomes for a generation of children. House Speaker Ryan, the Trump administration, and congressional allies have been pushing an agenda to reduce access to public benefit programs to pay for massive tax cuts for corporations and the wealthy.57 These attacks have been promoted as “welfare reform,” “workforce development,” “streamlining programs,” or “state flexibility”—all of which are code for cuts.58 Regardless of terminology, there are several ways that President Trump is seeking to make cuts to critical programs that help hardworking families with young children afford the basics. Despite the determination and work ethic of parents such as Kelly, too many young children in the United States grow up in families struggling to make ends meet. Without proper supports, these children will experience stressors that affect their long-term development. Fortunately, it is possible to dramatically cut child poverty and ensure that children have a strong start in life. It simply requires protecting families’ access to programs that help them meet their basic needs and have been shown to positively affect child outcomes. Closing the Meal Gap Act of 2017: The Closing the Meal Gap Act of 2017, introduced by Rep. Alma Adams (D-NC),66 would increase the minimum monthly SNAP benefit to $2567 and improve benefits by basing them on a more appropriate low-cost food plan. It would also require that jobless adults are offered a position in a SNAP employment and training program before their benefits can be time limited. Paycheck Fairness Act and Pay Equity for All Act of 2017: Female full-time workers earn 80 cents for every dollar men earn. The wage gap is even greater for women of color, with African American women and Latinas making 63 cents and 54 cents, respectively, for every dollar that white men earn.72 Ensuring wage parity across genders would cut poverty in half for working women and their families.73 The Paycheck Fairness Act would strengthen equal pay protections, including protecting workers from retaliation for discussing salaries with colleagues.74 The Pay Equity for All Act would prohibit employers from asking for salary history during the hiring process, which exacerbates existing pay inequities.75 Together, these bills would improve pay practices and enforcement policies and root out discrimination in the workplace. Regardless of political party, reducing child poverty and providing all people in the United States with the ability to meet their basic needs should be a core goal of any policy to come out of Washington. Elected officials who profess to care about the well-being of children and families must reject efforts to cut benefits programs. A real agenda for working families must strengthen work supports such as paid leave and child care and improve income supports for those trying to reach the middle class. Katie Hamm is the vice president of Early Childhood Policy at the Center for American Progress. Leila Schochet is the research and advocacy manager for Early Childhood Policy at the Center. Cristina Novoa is a policy analyst for Early Childhood Policy at the Center. The authors are grateful to Melissa Boteach, Katherine Gallagher Robbins, Thomas Huelskoetter, Shilpa Phadke, Heidi Schultheis, Jeremy Slevin, Rebecca Vallas, and Rachel West for their helpful comments on drafts of this report.